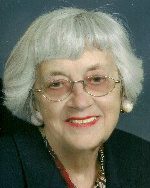 Mary Elizabeth Thomas Notz, nee Schrader, 88, of Belleville, IL, born July 15, 1929, in Belleville, IL, passed away on Saturday, February 10, 2018, at St. Paul’s Nursing Home in Belleville, IL. Mary was a homemaker, a longtime member of Our Lady Queen of Peace Catholic Church, a 1947 graduate of Belleville Township High School, and a 50-year member of the Delta Theta Tau sorority. She volunteered for many years at St. Louis Children’s Hospital and St. Elizabeth’s Hospital gift shop. Above all Mary was known for being an extremely kind person and a devoted and loving mother and grandmother. Mary loved to play cards, square dance and spend time with friends and family. Mary was preceded in death by her first husband, Charles F. Thomas, whom she married on Dec. 28, 1957, and who died April 26, 1991; her second husband, Robert W. Notz, whom she married on January 16, 1993, and who died January 29, 2015; her parents, Harold G.W. and Marie E., nee Klaus, Schrader; and her brother-in-law, Kenneth Castelli. She is also survived by her St. Paul’s family who provided exceptional care, compassion and friendship and we are very grateful to them. We would also like to thank Heartland Hospice for their care and support of Mom over the last few years. In lieu of flowers, memorials may be made to the Angelman Syndrome Foundation, to Heartland Hospice, or charity of donor’s choice. Condolences may be expressed to the family online at www.rennerfh.com. Visitation: Friends may visit with the family from 8:30 to 11 a.m. Friday, February 16, 2018, at Our Lady Queen of Peace Catholic Church, Belleville, IL. Funeral: Mass of Christian Burial will be at 11 a.m. Friday, February 16, 2018, at Our Lady Queen of Peace Catholic Church, Belleville, IL, with Fr. Matthew Elie officiating. Burial will be at Mount Carmel Cemetery, Belleville, IL. Prayers for comfort from Dan and I to his cousins on the loss of your beloved mother. Myron and Siblings, I am happy to have known your mother for several years. Her ready smile was always welcoming, and her rascally sense of humor was entertaining to be around. I also appreciated Bob, who had many interesting stories about the Green Bay area and who contributed much with his volunteer work. I am sorry I did not have the opportunity to meet your father, but I am happy to count Myron as my friend. Myron & Family I am so very sorry for your loss it is never easy to lose a loved one. My thoughts and prayers are with you all.